Dr. Ganeshan Wignaraja joined the Lakshman Kadirgamar Institute in July 2017. He also serves as a member of the Task Force on the Freedom of Navigation in the Indian Ocean, chaired by the Hon. Prime Minister, and is a member of the Monetary Policy Consultative Committee of the Central Bank of Sri Lanka. He has a DPhil in economics from Oxford University, and a BSc in economics from the London School of Economics. What is Next for Middle-Income Asia and Sri Lanka? Decades of sustained economic growth have left the Asia Pacific with few lower-income countries. Absolute poverty levels are and will continue to keep falling. This is cause for celebration. But it also requires a new partnership between countries and development institutions to tackle the challenges that arise as Asia becomes an upper middle-income continent. The narrative in Sri Lanka should shift from a costly domestic political crisis to a national debate on development priorities. Put another way, half of the world’s population in 2025 will likely live in Asian middle-income countries. Today, almost all of the region’s nations already enjoy middle-income status. And more are moving beyond USD 4000 per capita income, signifying a shift from lower middle-income to upper middle-income status. By 2025, only Afghanistan and Nepal are expected to remain officially poor. This progress is positive. Millions have been lifted out of extreme poverty over the past decade alone, with just as many now benefitting from improved education and health. But it also requires a rethink of the policy obstacles that Asian countries must now overcome, and the way in which they interact with bilateral and multilateral development institutions. Middle-income status does not mean development gets suddenly easier. While Asia’s growth still outpaces global growth, it has slowed since the global financial crisis. This has led some to argue that Asia is facing a middle-income trap, where growth slows after reaching middle-income levels and the transition to high-income levels seems a distant prospect. Malaysia and Indonesia are often mentioned as examples. Ageing populations are another challenge, particularly in China, South Korea and East Asia.2 This will translate into rising dependency ratios, increasing elderly care costs and probably higher taxation. Moving nations out of extreme poverty also tells us little about the extent to which their people are vulnerable to falling backwards. This vulnerable group of people — those who hover precariously above the poverty line but do not advance quickly towards middle-class status — is expanding in Asia. In countries from India to Indonesia to the Philippines and Bangladesh, this category now covers hundreds of millions of citizens. Tackling these challenges requires different policies by governments in Asia, both to continue to push growth but also to make it more equitable. Improving innovation, tertiary and vocational education, digital infrastructure, financial access for small businesses, elderly care and pensions systems and institutions can help put Asia on the path to developed, high-income status. These policies should be tailored to individual national circumstances along with gradual opening up. The days of transplanting a one-size fits all development model – be it a Washington neo-liberal consensus or a Beijing consensus of an eclectic approach to free markets and a big role for state enterprise – are over. Sri Lanka aspires to become an upper-middle income economy. In 2019, however, country faces the prospect of tepid growth of 4% or thereabouts with rising inequality. Additionally, a debt to GDP ratio well in excess of 70% and downgrading of debt rating implies limited head room for raising public expenditure. This depressing domestic economic scenario could be complicated by unpredictable weather affecting agriculture, and political instability. Multiple global risks are also looming on the country’s horizon including escalating trade tensions between the US and China, capital outflows from emerging markets, and geopolitical tensions. Once the political dust settles, a national debate is needed to move on from the political crisis to a policy agenda for the next couple of years. Seven important questions come to mind. How does political uncertainty affect private investment and growth? Do high debt service payments mean fiscal austerity? How can lagging productivity be improved? How might the digital economy take root? Is rising inequality temporary or permanent? How can the cost of living be reduced and development be spread outside Colombo? What economic reforms are necessary? Successful countries from Korea to Singapore have spent time finding answers to these issues and forging a national policy consensus for their economic development. Sri Lanka could productively follow suit. Asia’s new middle-income era also poses questions for development institutions.4 Improved income status means Asia’s development finance landscape is quickly changing. As countries become wealthier the sources of finance and financial instruments available to them will change, as will the volumes of aid they receive and the conditions attached to it. Borrowing from international capital markets will become crucial, with rating agencies influencing the terms on which they can do so. Middle-income status is often considered a signal for a successful development trajectory — hence the rationale for development institutions to play a progressively smaller role. But development institutions should not move from an aid relationship with Asia to simply no relationship at all. Instead, they need to create a new and different kind of relationship, based at first on a mixture of aid and trade, and eventually trade and private investment alone — in the process finding new ways to help transform Asian nations whose development journeys are only at most mid-way complete. 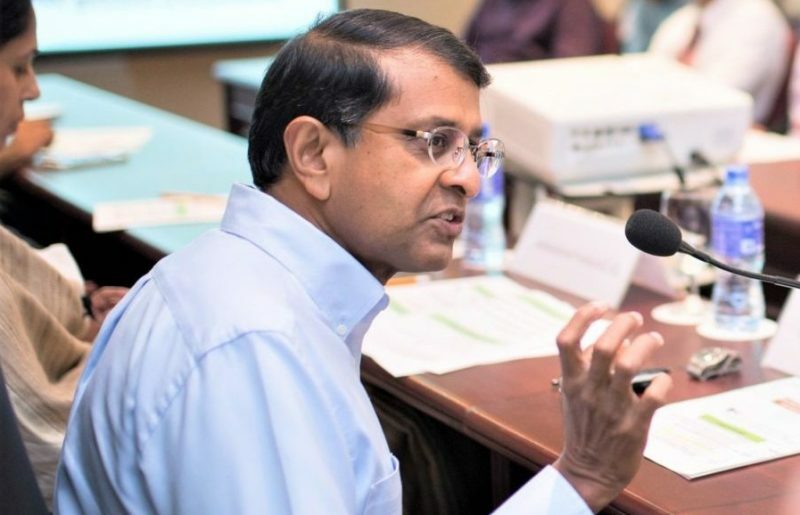 *Dr. Ganeshan Wignaraja is the Executive Director of the Lakshman Kadirgamar Institute of International Relations and Strategic Studies (LKI) in Colombo. This is a revised version of an article for Dr. Wignaraja’s appearance at the Asia in the World Economy Roundtable 2018, hosted at the Lee Kuan Yew School of Public Policy in Singapore from 29–30 November. The opinions expressed in this article are the author’s own and not the institutional views of LKI, and do not necessarily reflect the position of any other institution or individual with which the author is affiliated. 1 Wilson, T. (2017). No Long-term Solution in Sight for the Rohingya Crisis. [online] East Asia Forum. Available at: http://www.eastasiaforum.org/2017/09/22/no-long-term-solution-in-sight-for-the-rohingya-crisis/. 2 Fang, C. (2018). China Must Transcend its Declining Demographic Dividend. [online] East Asia Forum. Available at: http://www.eastasiaforum.org/2018/11/12/china-must-transcend-its-declining-demographic-dividend/. 3 Park, C.Y. (2016). Inequality in Asia: The Case for Inclusive Growth. [online] East Asia Forum. Available at: http://www.eastasiaforum.org/2016/07/22/inequality-in-asia-the-case-for-inclusive-growth/. 4 Wignaraja, G., Tyson J., Prizzon, A., and Willem te Velde, D. (2018). Asia in 2025: Development Prospects and Challenges for Middle-income Countries. Overseas Development Institute. Available at: https://www.odi.org/publications/11202-asia-2025-development-prospects-and-challenges-middle-income-countries.